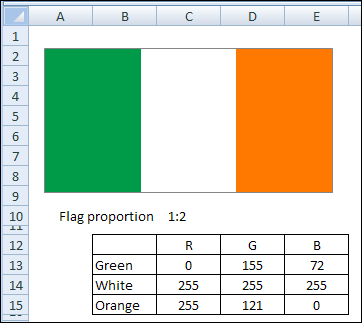 A tri-colour in Excel? Is feider linn. Contextures blog did it using a column chart, removing the gaps between bars and customising colours. A simple project with useful techniques thrown in. Happy St Patrick’s Day from Business Brains. made a column chart from that data. And after you finish your flag, you can learn how to pronounce Éirinn go Brách, just in time for your St. Patrick’s Day parties. via Excel Go Brach – Excelebrations | Contextures Blog.